The last three fishing shirts I’ve worn (various brands) were miserable failures, and the reason is that no matter how technically sophisticated the weave, these shirts encouraged your body to sweat. The culprit is easily identifiable – and ubiquitous: nylon. Nylon, quite simply, is plastic (thermoplastic, for those with chemistry degrees), and wearing plastic encourages perspiration. Nylon is over-used in far too many garments: people in the jogging community started grumbling about this years ago, and the industry has slowly, sometimes grudgingly, adapted. It’s now time for clothing manufacturers for other sporting activities to catch up with the jogging industry, and adapt. If this sounds like a “the king isn’t wearing any clothes” moment, that’s because it is. I don’t buy the whole “superior wicking” tag that’s applied to nylon garments. Superior wicking – which is just a looser, open-style weave pattern – is needed because you’re wrapping yourself in plastic. Nylon, however, does dry quicker than cotton, so how much (or little) nylon to incorporate into a total fabric blend is highly debatable. Another variable: some people just sweat more than others…. What I do know from observation is that fabrics that are high in nylon content are nearly always sweat-marked just moments after being worn in the sun – something that isn’t quite as true when good quality cotton fabrics are involved. Best left to clothing manufacturers to come up with the ideal blend. 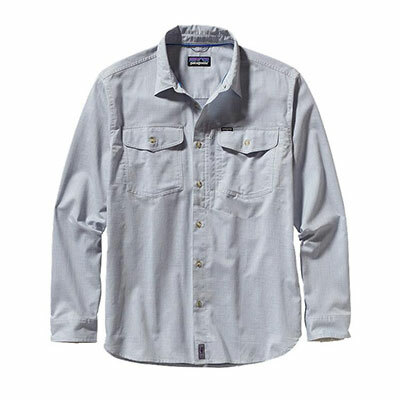 Patagonia’s Cayo Largo shirt ($89) might just set the standard for that perfect blend: 69% organic cotton/25% nylon/6% hemp. This amounts to a super lightweight 2.5-oz cotton technical blend that breathes easily, even in stifling heat. It also dries impressively fast. Two front-buttoned pockets and a hidden front-chest zip pocket hold essentials securely above the waterline. It also features a chest zipper-closed utility pocket for valuables. These are all things I expect from a top-notch fishing shirt. What puts this shirt in the superstar category is that it washes up better than any other shirt that I’ve worn – ever. Let’s get back to plastics. With common detergents, organics – like fish blood – will wash out of nylon very well. Synthetic stains are a sad, and different story, as witnessed by anyone who has brushed up against a dirty/greasy outboard or encountered reel grease. Often, even repeated washings will not eliminate stains: your nylon shirt will be soiled for a long, long time. Perhaps permanently. Not so for cotton: if stains are washed out in a timely fashion, they’re gone. Completely. The Cayo Largo shirt has nailed that magical blend: breathability and washability are both excellent. Final note, the shirt panels are cut up and stitched together for maximum comfort and durability: this is a fishing-specific garment that will not fail you.